Home » Child Care » 10! 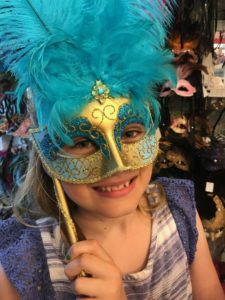 Laissez le Bon Temps Rouler! 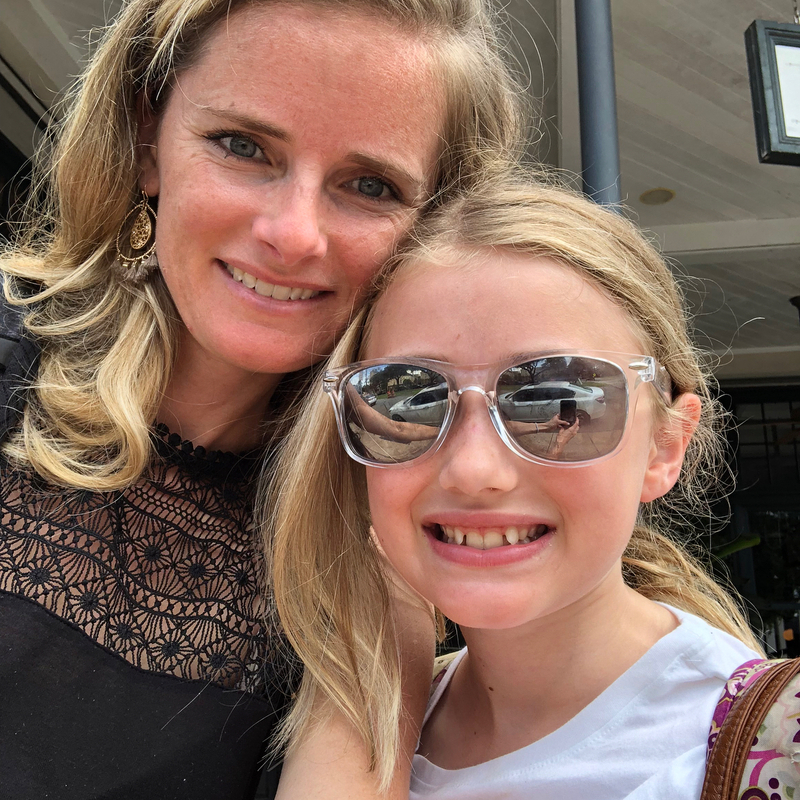 Earlier this summer our first born turned 10. To celebrate this special milestone Chris and I took her to New Orleans. Just the three of us. The original three, as we sometimes say when the other kids aren’t around. The hardest part of the trip? 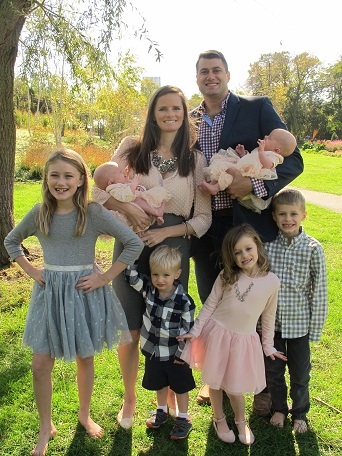 Finding childcare for Mack, Vivian, Ben, Elinor and Juliet. The twins went with my parents. Vivian spent the weekend with my lovely Aunt Sheila. And we hired a college girl to mind the boys. Coordinating it all was a game of chess, but the time with our big girl was worth every ounce of effort. 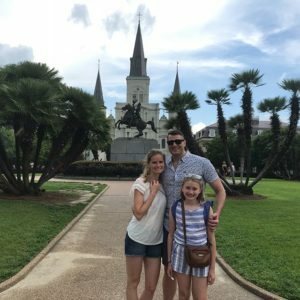 None of us had ever visited New Orleans, so we planned a loose itinerary that gave us the freedom to explore the city and relax. 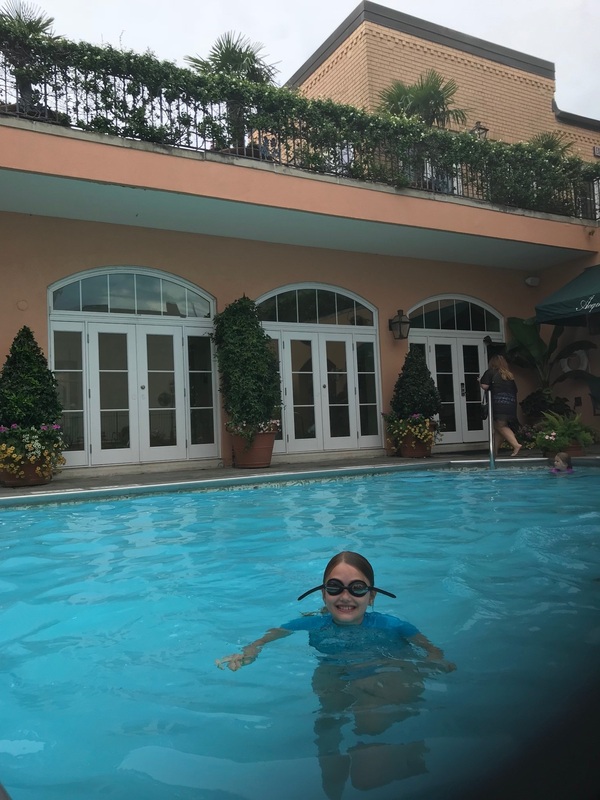 We stayed at the Hotel Monteleone in the French Quarter, which was walking distance to plenty of sights. 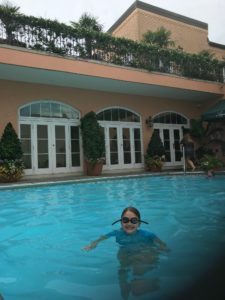 Of course, Evie loved the roof top pool! 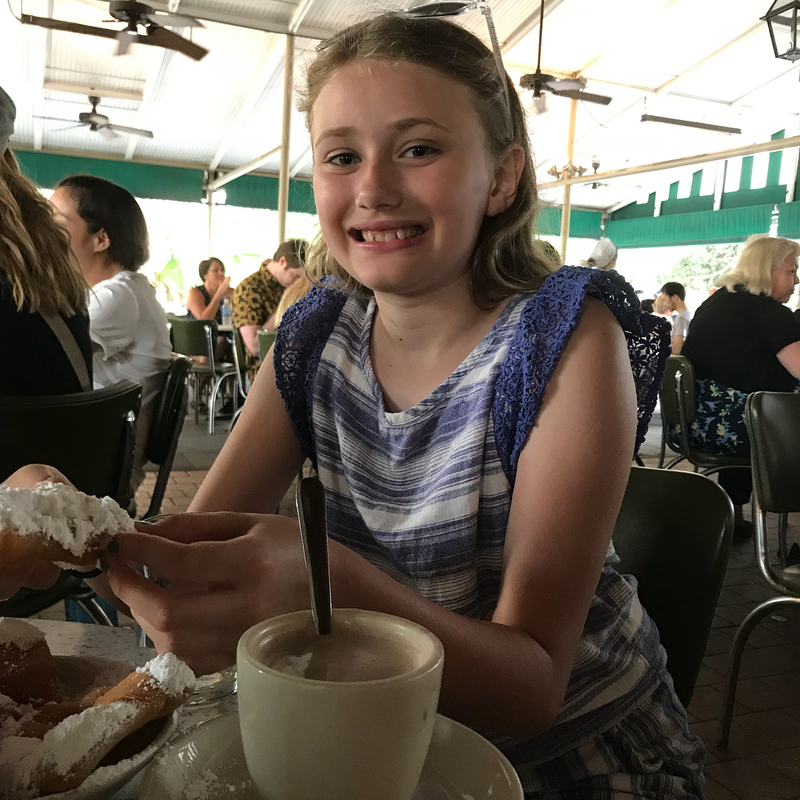 One of our first stops was Cafe du Monde for beignets and cafe au laits. 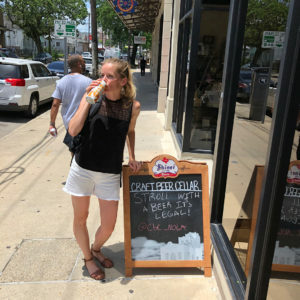 I don’t even like coffee, but I still ordered a cup! Upon to recommendation of a colleague, we took the streetcar to a pretty neighborhood for dinner at Pascal’s Manale , where Chris ordered the messy barbequed shrimp. 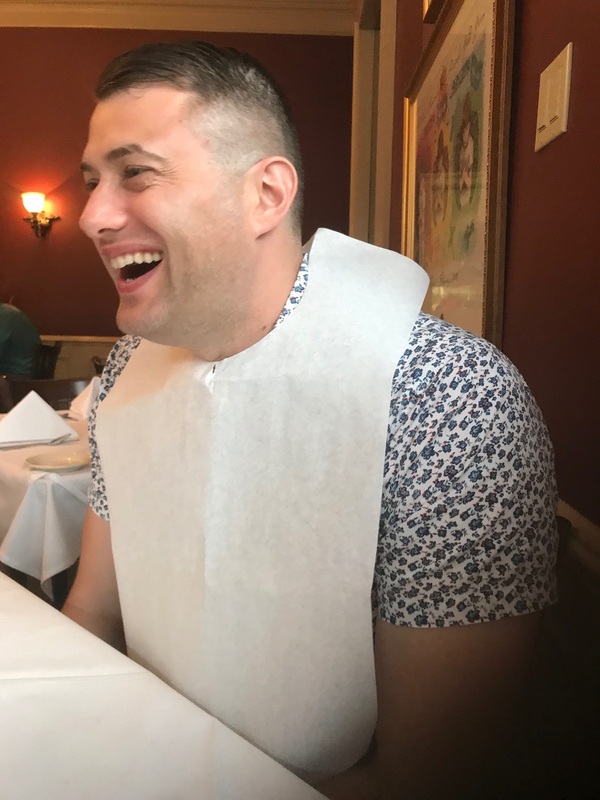 We all got a good laugh out of the bib! 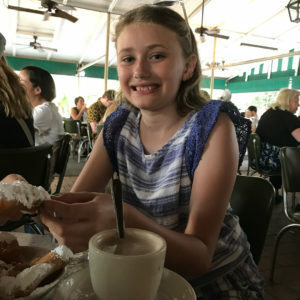 Evie’s favorite part of New Orleans? Magazine Street’s six miles of cute shops and cafes. Hard to argue with that! Chris was such trooper – he graciously stopped in every store that looked interesting to Evie and he never complained once. It was like 95 degrees, so we enjoyed cold beers on the long walk. The trip was only two days, but we all felt like we really got away. Uninterrupted time with Evie gave Chris and me a chance to get to know her a little better, without the constant distractions of her younger siblings and the busyness of home. 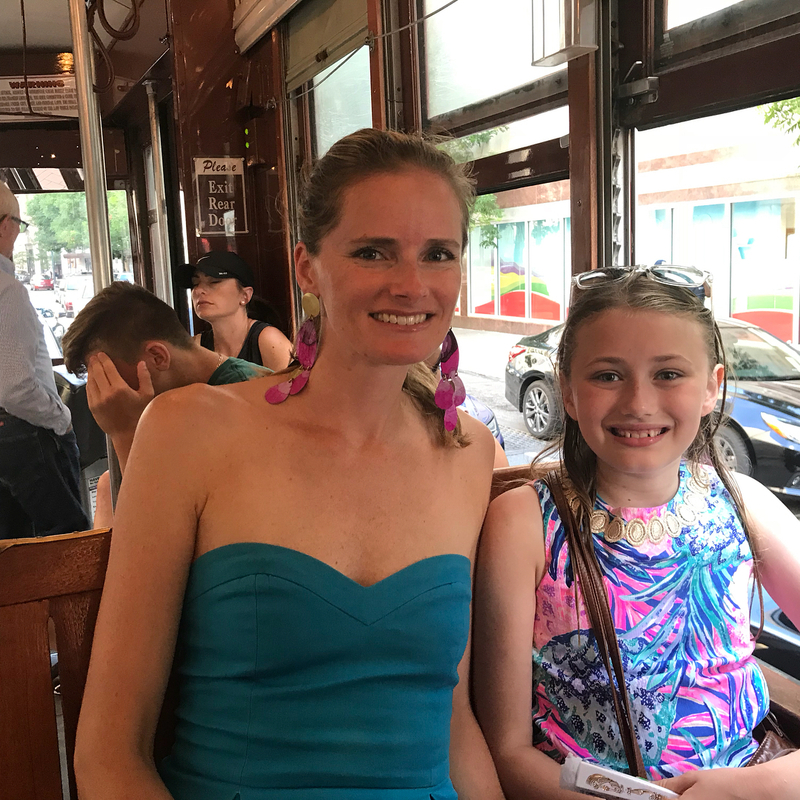 I am so grateful, and I plan to do a similar trip with all our kids when they turn 10. Evie is still learning how to be a human in this world, but every day I am astounded by how aware and able she has become. 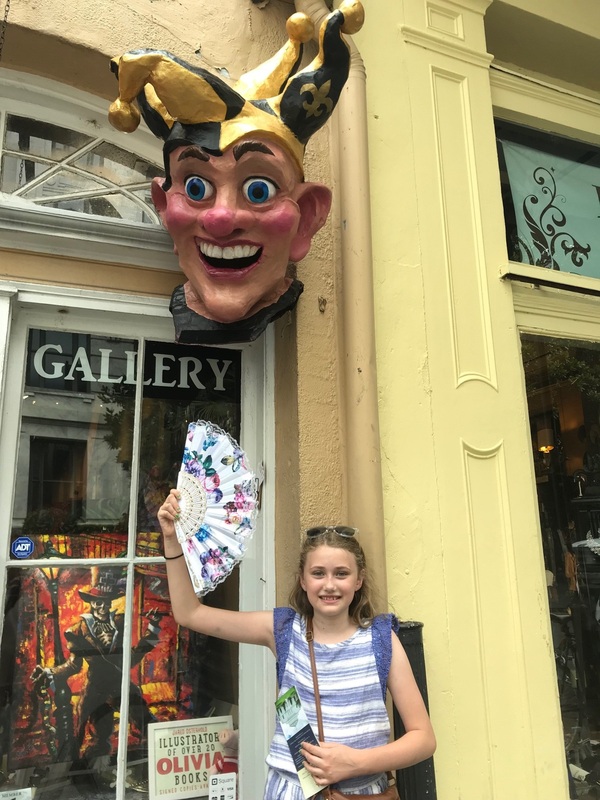 My dad recently reminded me that he biked Europe alone at the age of 17, and trying to imagine Evie doing the same in just seven years gave me a minor panic attack. But, I have to believe that the world we are showing her is preparing her to take on the planet. S is is the spitting image of BOTH you & Chris! Such a beautiful lady inside & out! Happy 10 th all year!! I know, this is werid. Me being on your website looking at old memories. The thing is it makes me feel better. Sometimes it makes me cry because it makes me miss the old days. I just want to say I love you. That’s it. I love you. I love you so much. I am writing this blog for YOU so we can all remember the special times we have together. Every minute we have is important. You are so special to me!